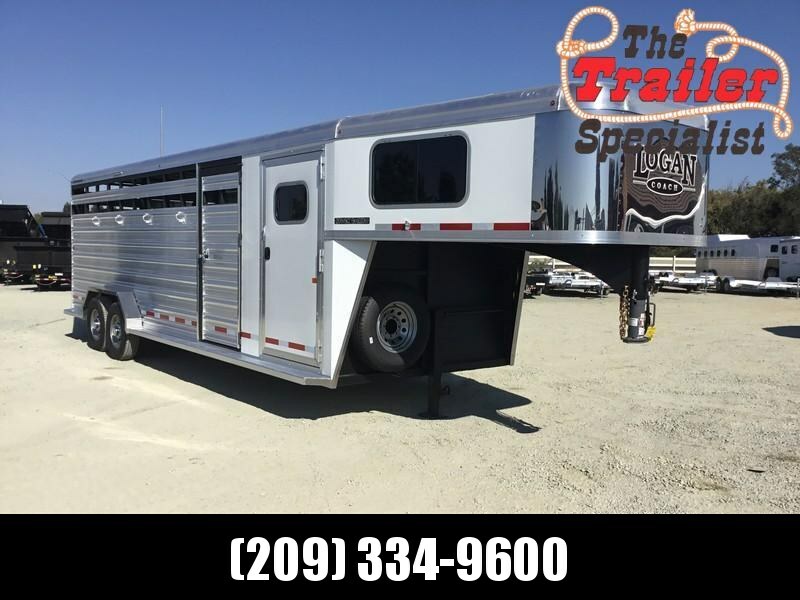 New 2018 Hart Lariat. 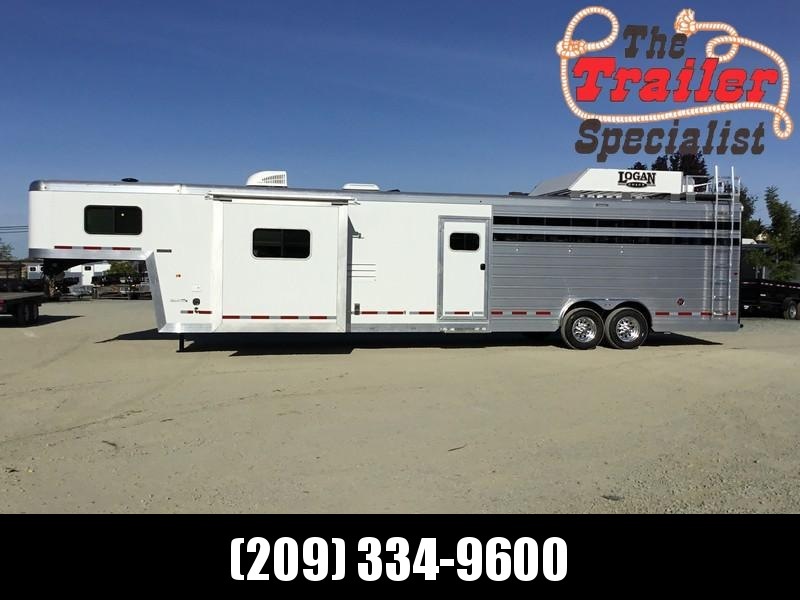 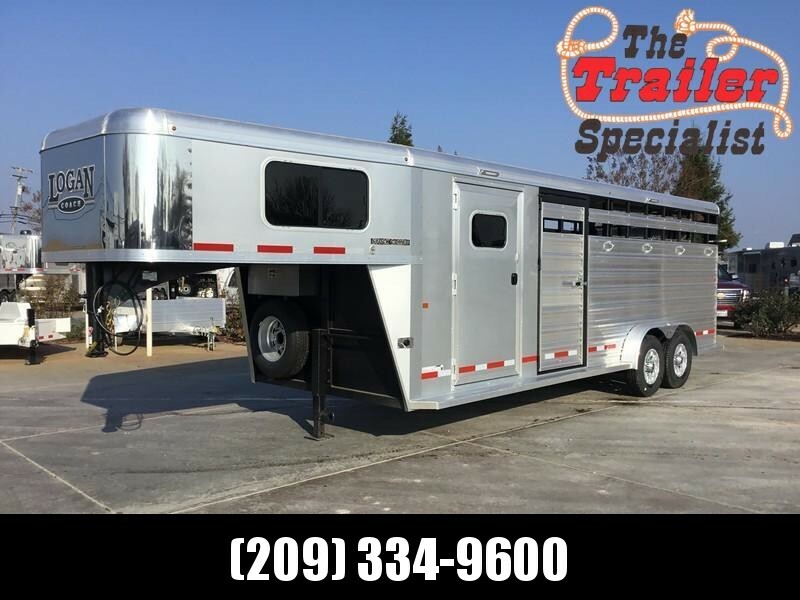 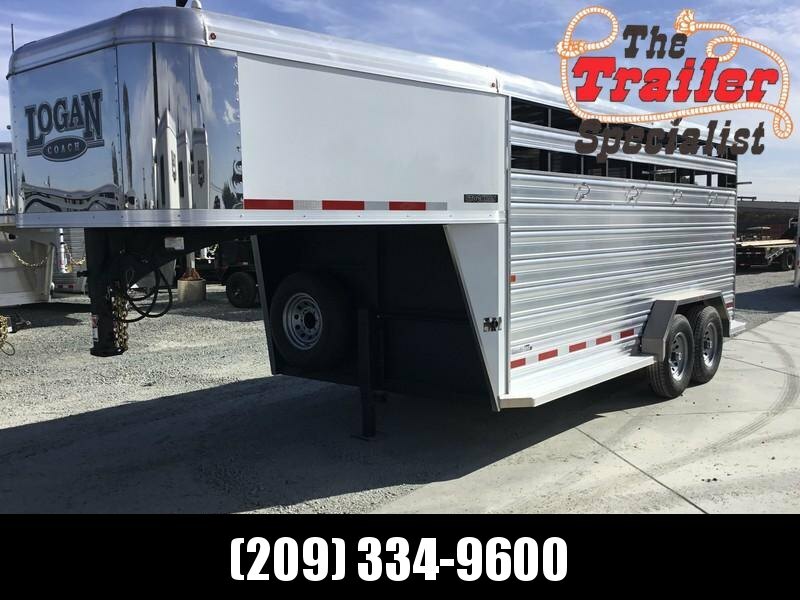 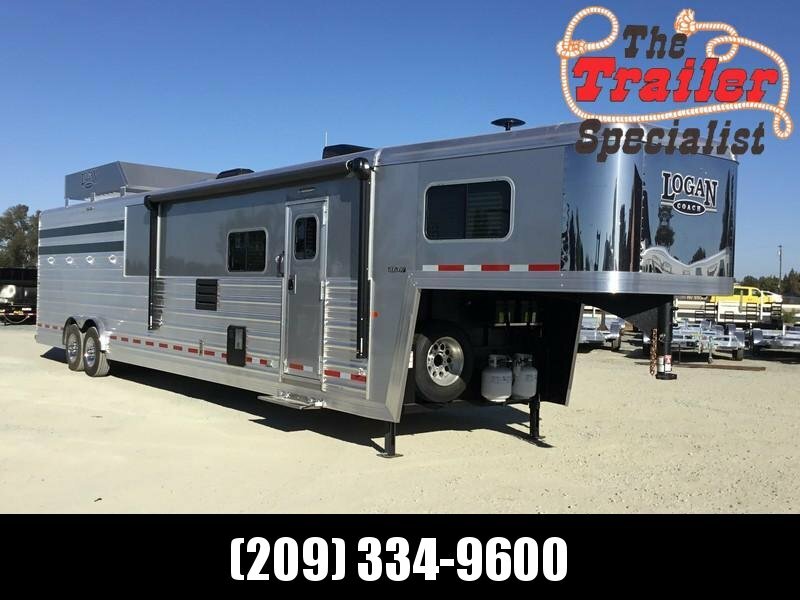 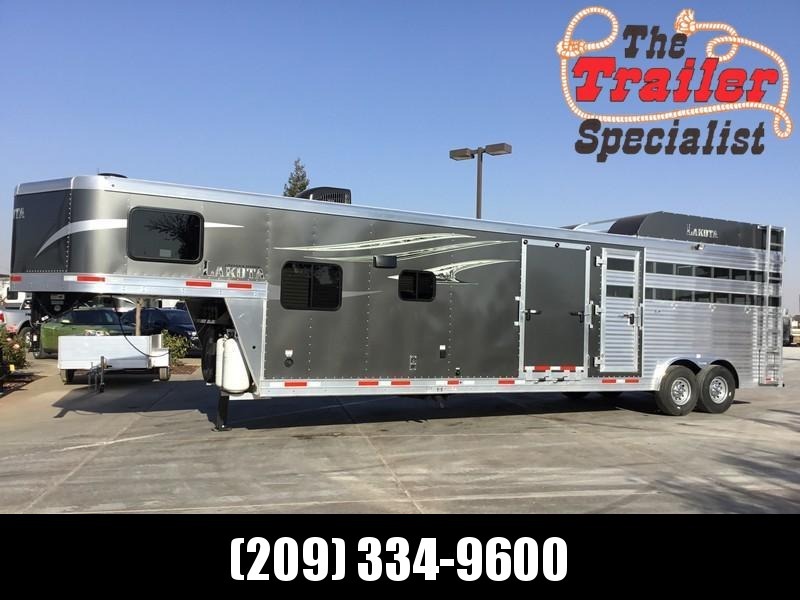 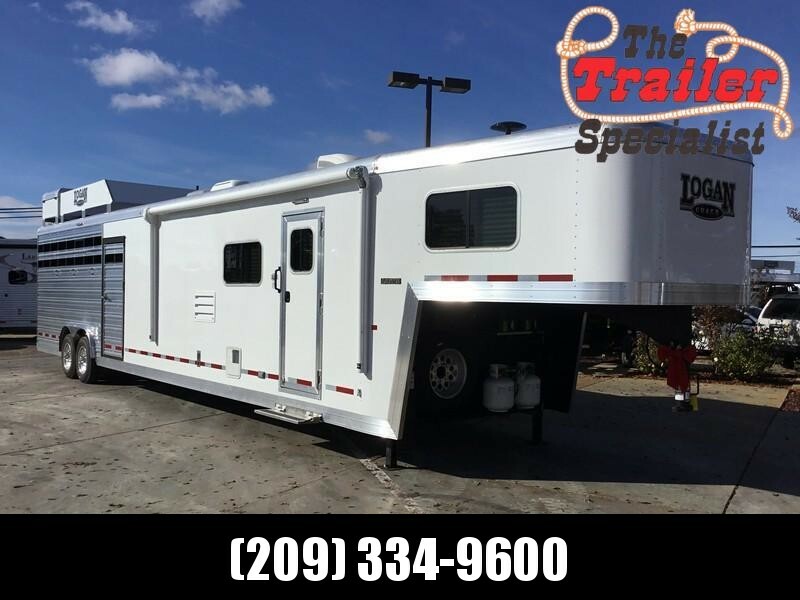 This fantastic all-aluminum stock combo trailer is 7ft 6in wide and 7ft 1in tall, 22ft on the floor with the stock area at 18ft and tack room at 4ft, with a slant wall ILO a straight wall and an overall length of 29ft. 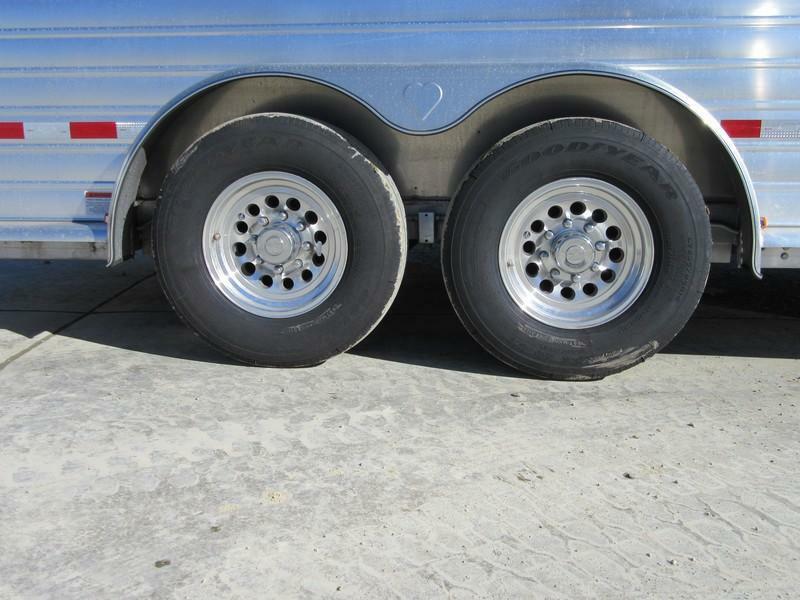 It has two 7K axles with load range G Goodyear radial tires. 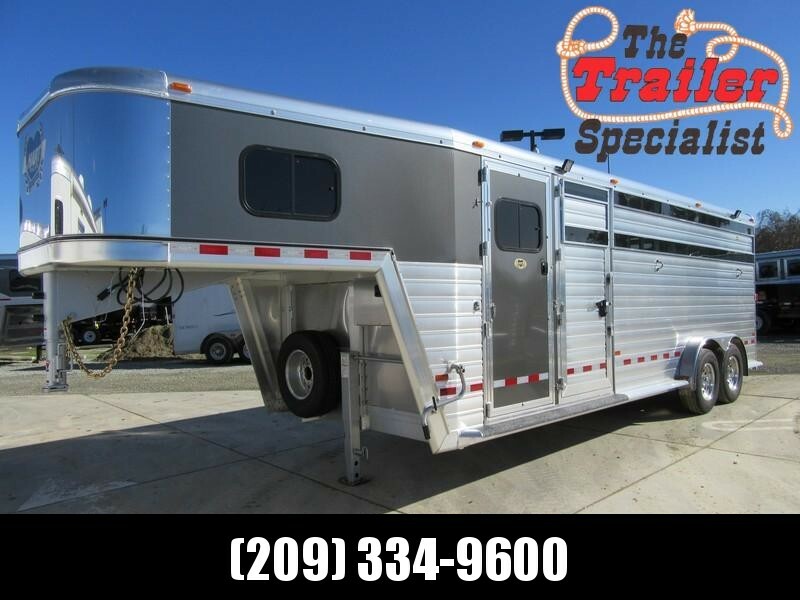 Comes with double LED lights all the way around and five exterior LED flood lights. 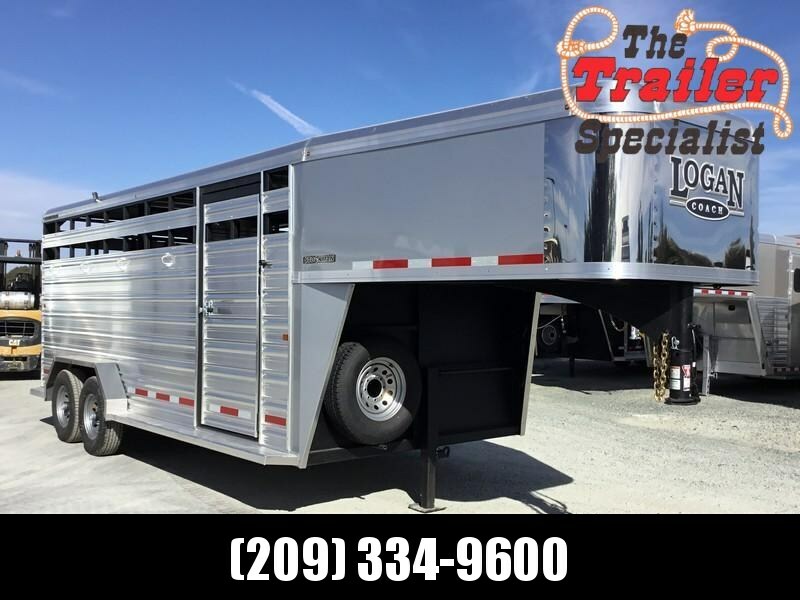 Hart trailers are built standard with rectangular upright posts, which are 33% stronger then C-shaped posts, and integrated I-beam cross members on 6" centers. 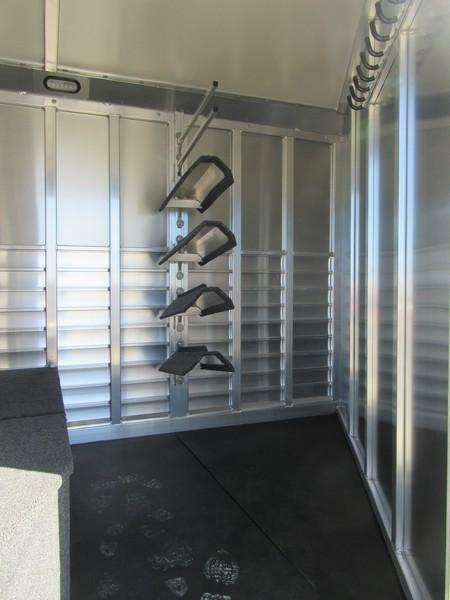 The unique interlocking tongue and groove floor which comes 0.140" thick is 20% thicker than the industry standard. 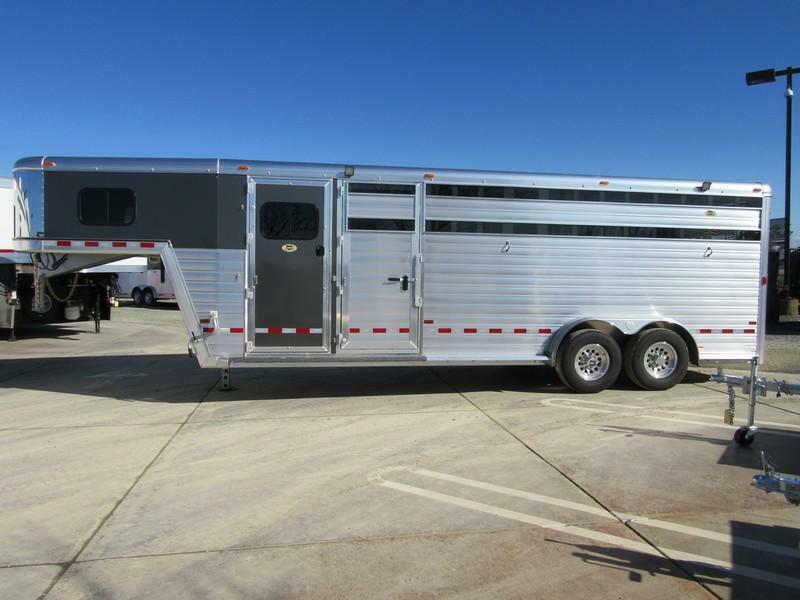 The two Dexter Torflex axles will help keep the ride smooth for your horses. 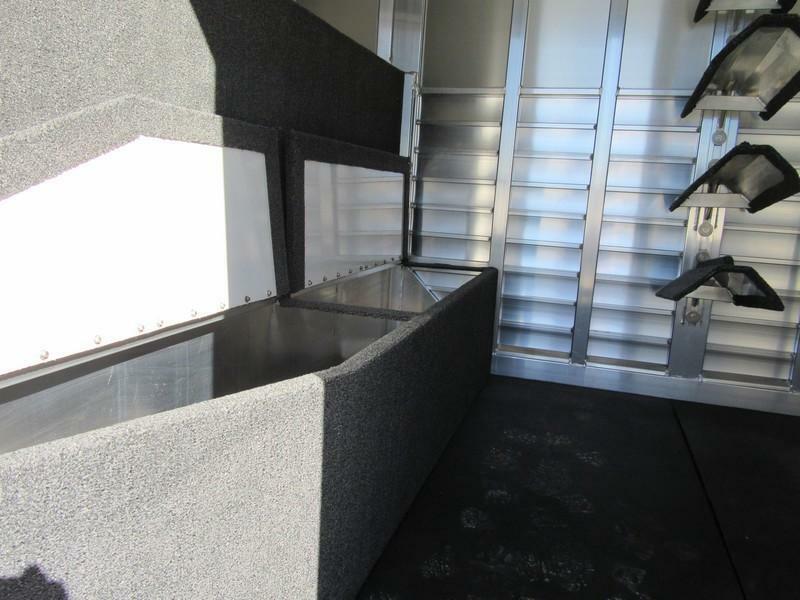 They also have a 3" raised GN structure for larger 4x4 type trucks. 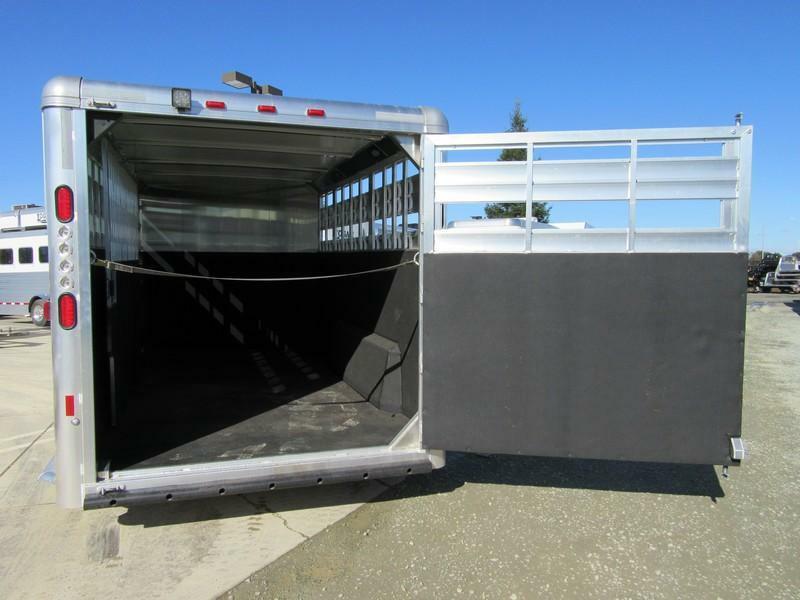 Hart uses a fully insulated AÂ½in thick fiberglass composite roof panel, the ultimate in climate control, quietness and strength. 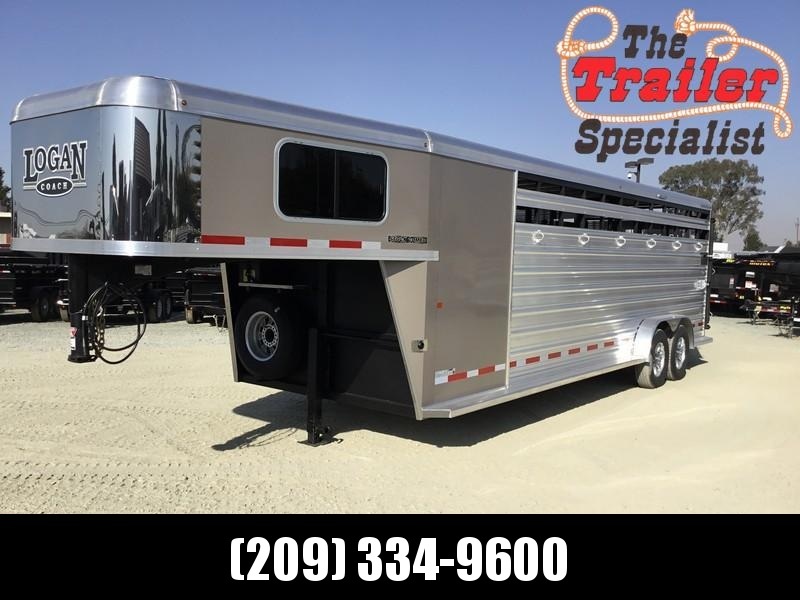 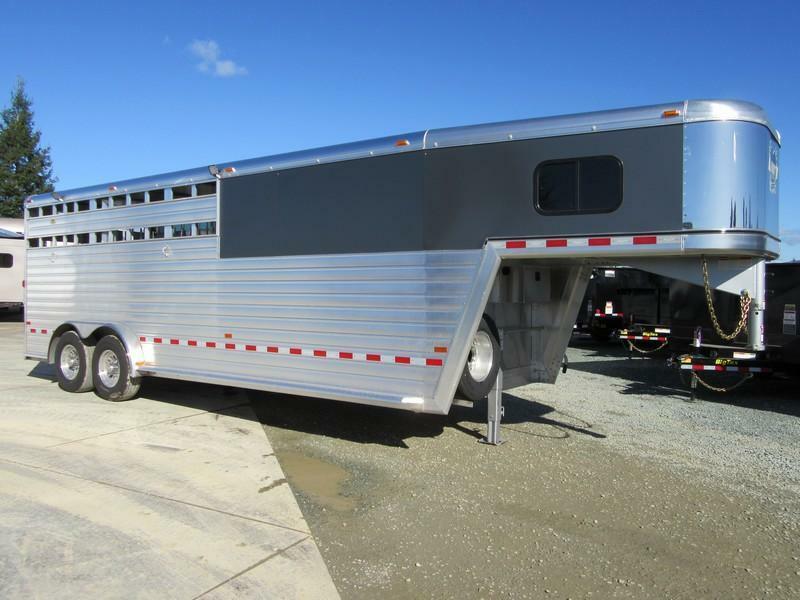 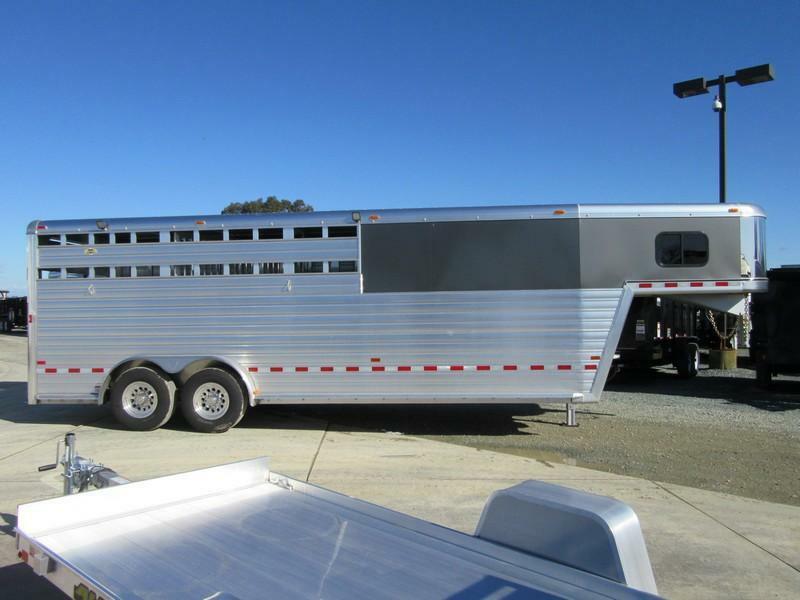 Aluminum extrusions on the exterior walls make the trailer extremely strong for maximum protection for your livestock. 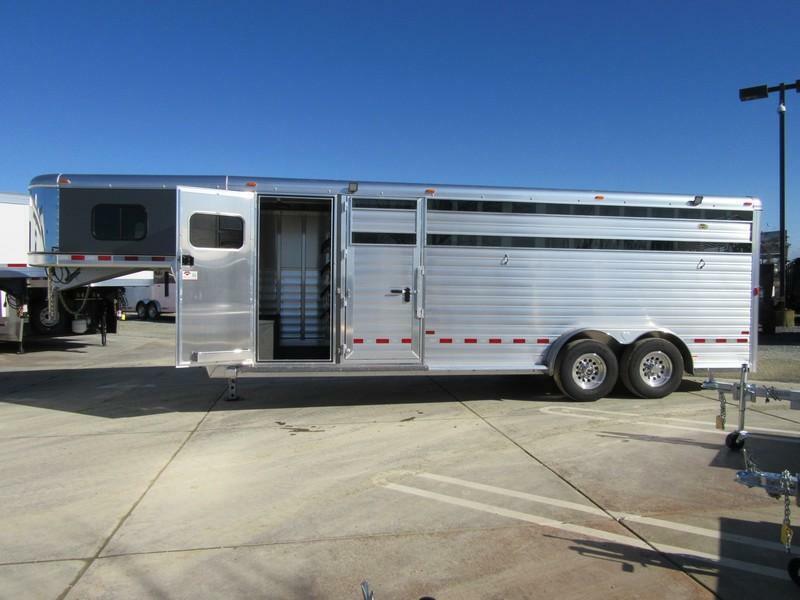 Above the extrusions in the tack area is .050 White aluminum skin. 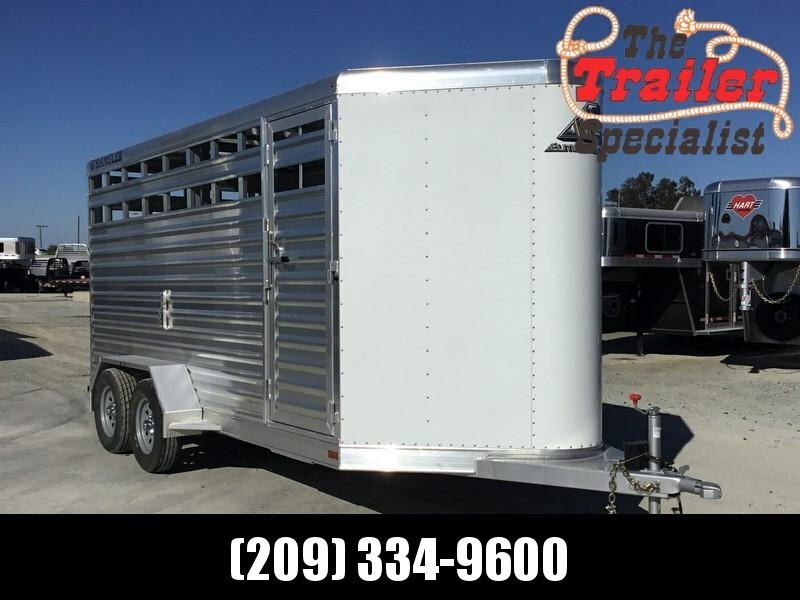 The stock area is 18' long and has an angle wall separating the tack room and stock area instead of a straight wall, along with an escape gate on the left hand side. 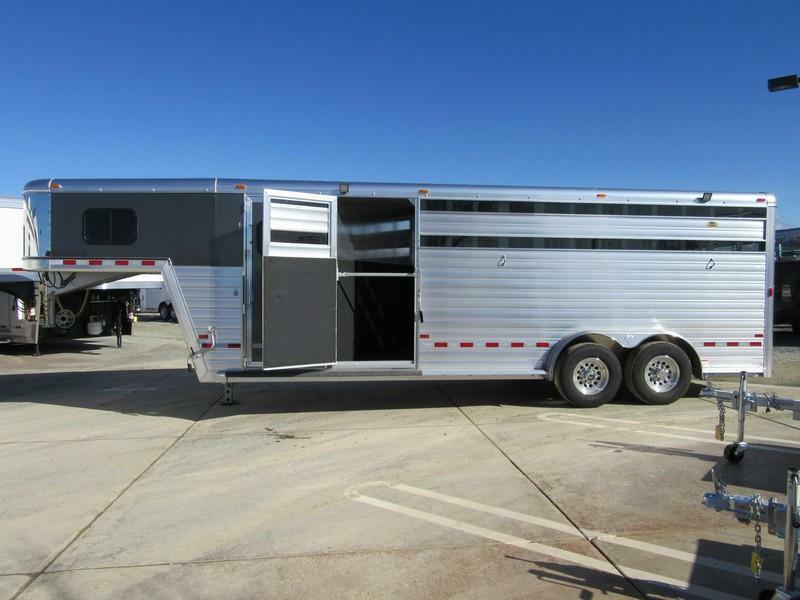 The interior includes 6 tie loops, and LED lights on each side. 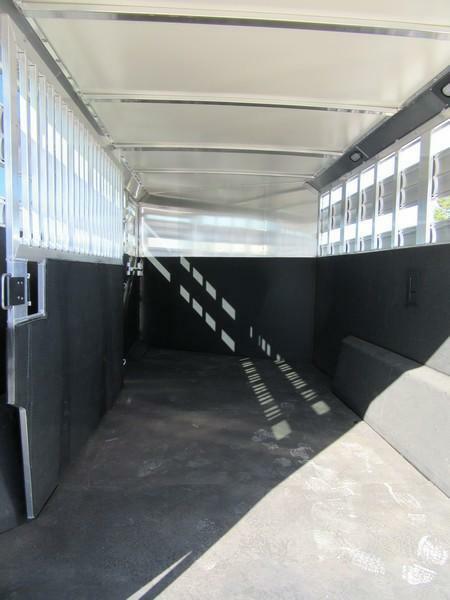 It is equipped with rubber floor mats, and kick mats on all 4 walls that go up 50". 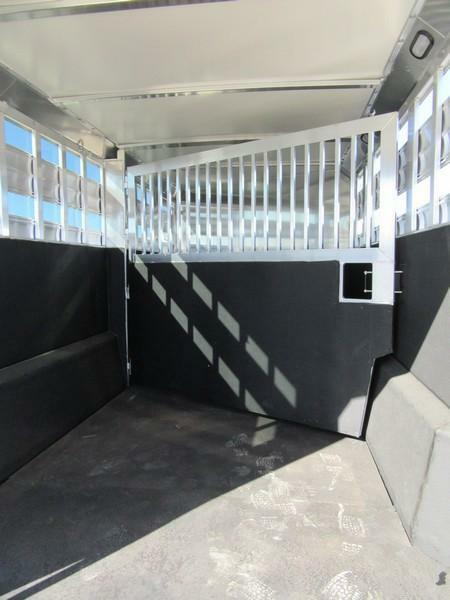 It also has a slam center gate also set at an angle, and a full width rear gate. 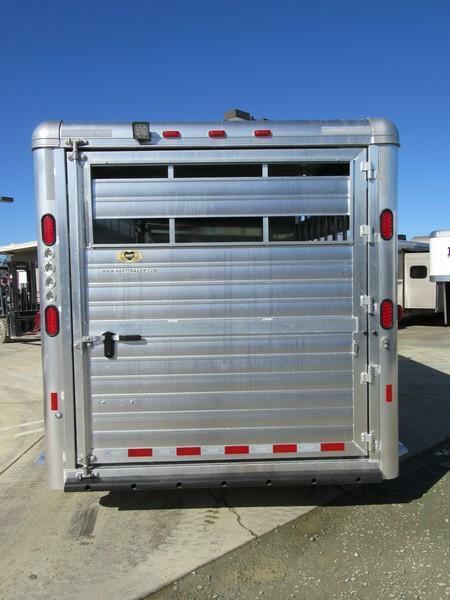 On the outside there are 3 ties on each side. 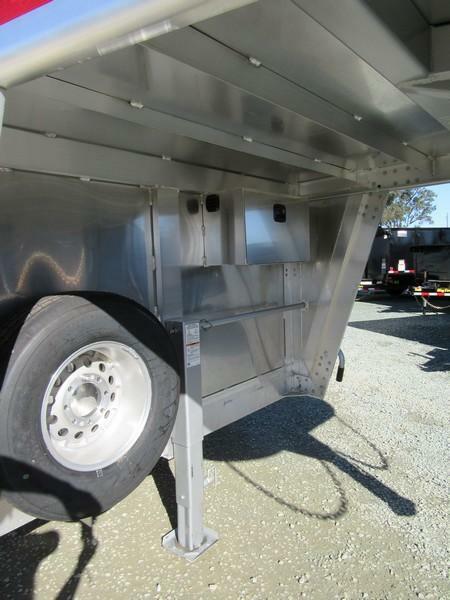 For better visibility there are two exterior LED flood lights on each side and one on the back for easy loading. 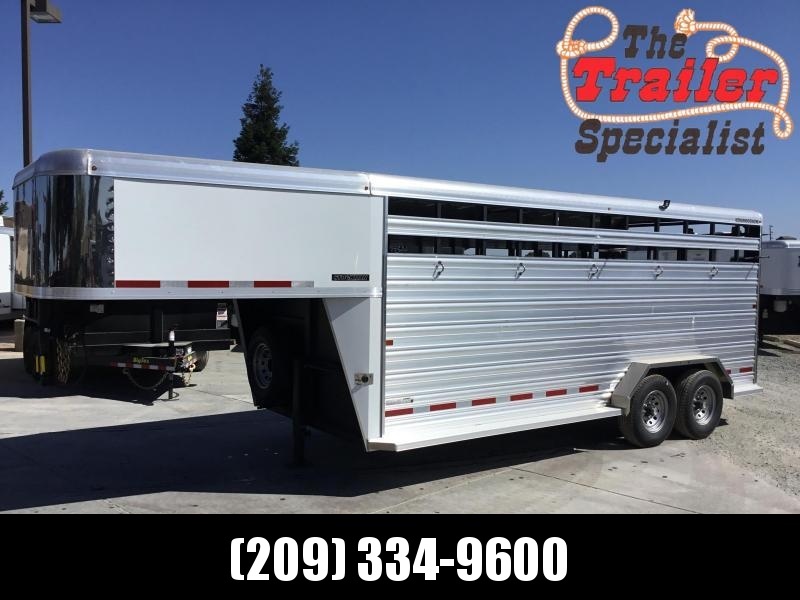 This trailer has the rail for sliding in Plexiglass over the open slats on both sides with the Plexiglass included for the left hand side for more control in inclement weather. 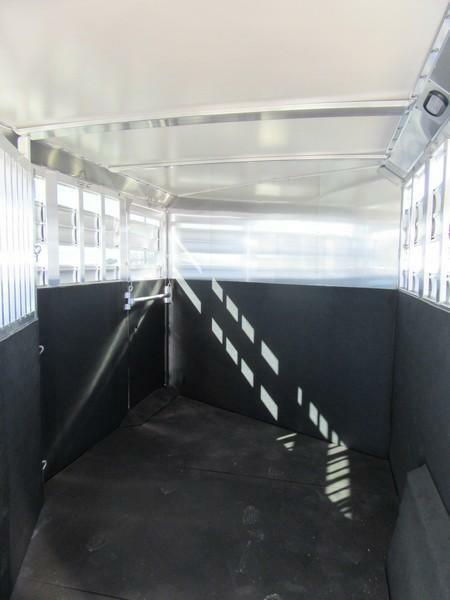 The tack room has a 4' short wall with everything you need for your horse or stock events. 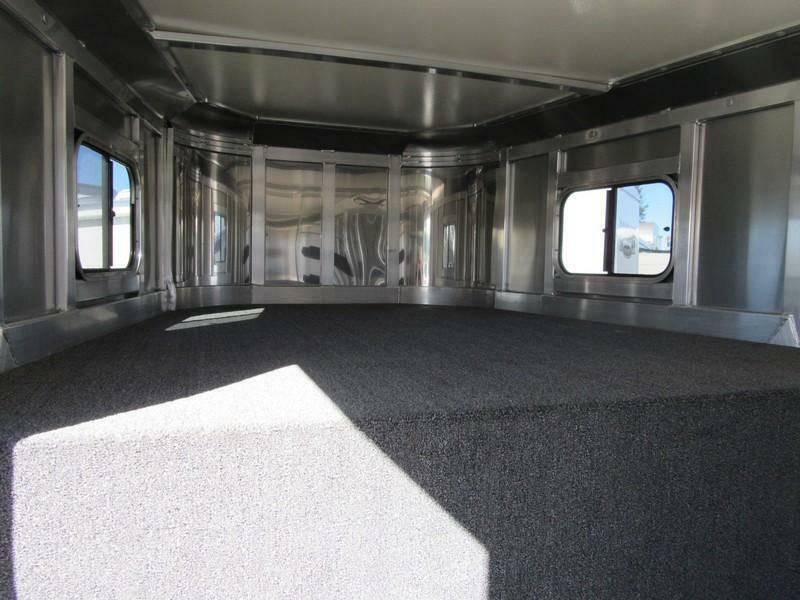 There is carpet on the bulkhead wall and gooseneck deck. 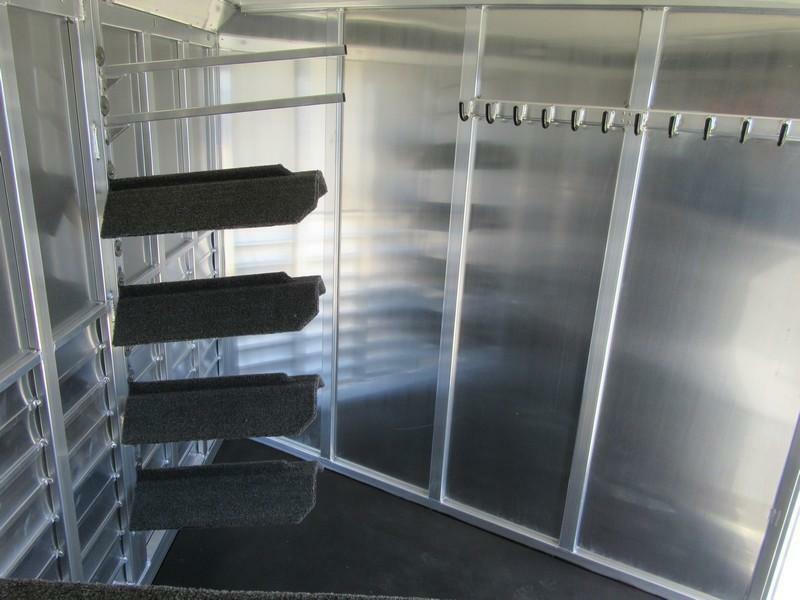 It has rubber mats on the floor of the tack area for easier cleaning. 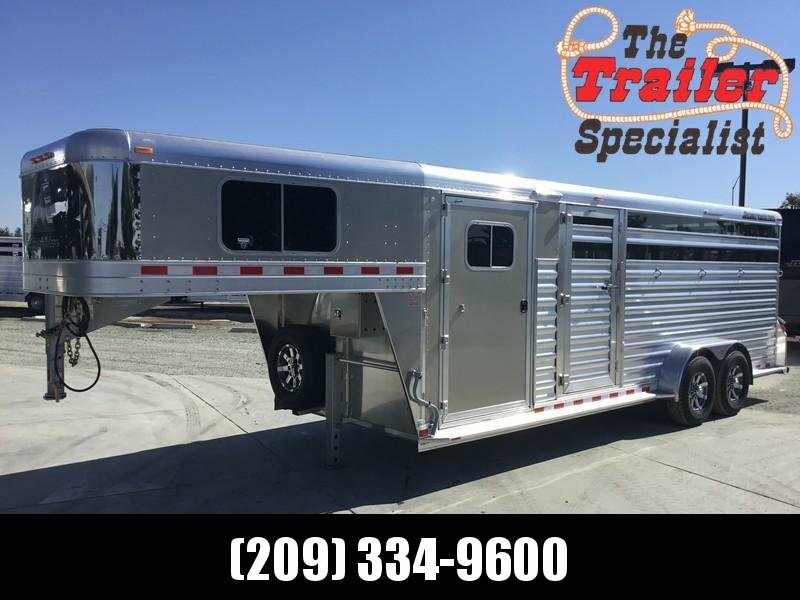 The tack door has a brush box and opens to a full width carpeted boot box at the bulkhead wall and a 4 tier saddle rack on the back wall with two blanket bars above the saddle racks. 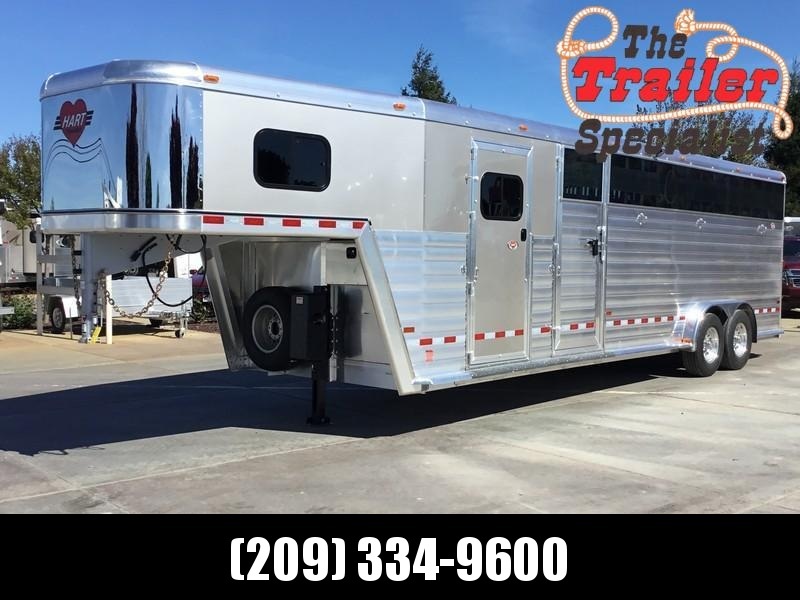 There are 12 total bridle hooks on the angle wall and windows of either side of the gooseneck area for better ventilation and LED interior lights for better visibility. 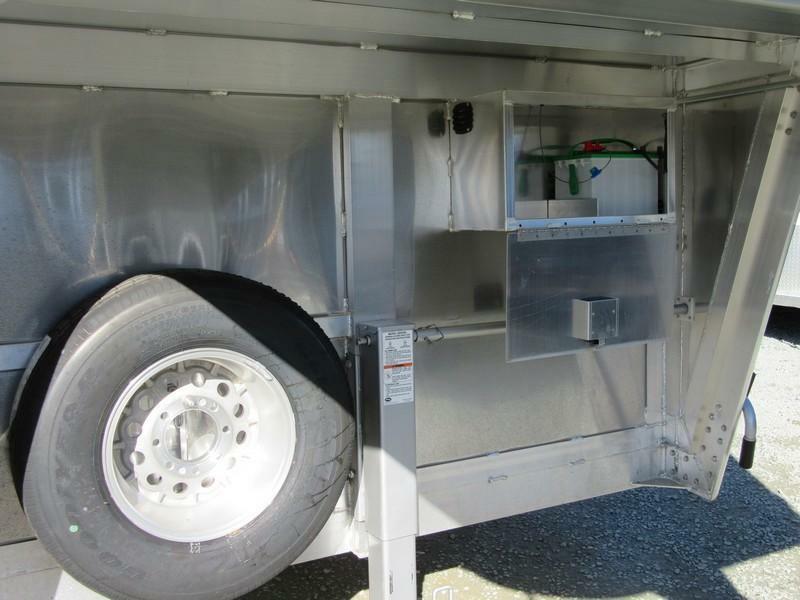 The auxiliary battery mounted in a box under the gooseneck will run your inside lights when not hitched up to the truck. 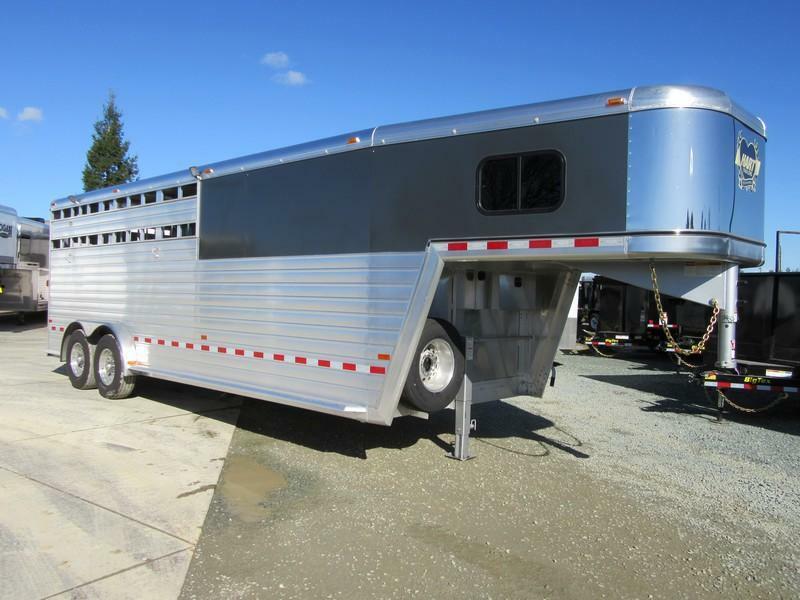 Last but not least Hart comes with an excellent warranty with an 8 year structural warranty on any trailer.